Class every Monday from 6-7 EXCEPT July 30th. No class on July 30th. 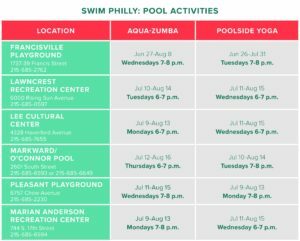 Our Philly Powered partners at Roots2Rise and Yoga Habit are providing stellar yoga instruction, while 3 of the best AquaZumba instructors in the city will help us shake a tail feather for health. Classes are meant for adults of all ages and fitness levels, so come stretch out the stress at pool-side yoga or beat the heat while shaking your hips in AquaZumba.